I’ve never been a huge fan of eggs. I wrote recently about how my mom made the best eggs on the planet when I was a kid – she’s a ridiculously awesome cook – to this day no one can make them like she can. But I only liked scrambled eggs back then, and since like I said Mom spoiled me with the best eggs in the Universe, I never really learned to appreciate eggs in any other way, that is, until this year. A little while ago, Aaron and I went to a Tasting Table Dinner Tales event at Perbacco here in the City. One of the courses was a ravioli with a duck egg inside. When you cut into the ravioli, the yolk of the egg would burst, resulting in a rich, velvety sauce made by the yolk and the other ingredients on the plate. It was superb. Since then, I’ve been eager to try more things that utilized a runny egg to add that extra depth of texture and flavor to a dish. Today, while at lunch with Laurie and Fred at a place called Piccino, when I saw an option to “add an egg to any pizza”, I was totally stoked. 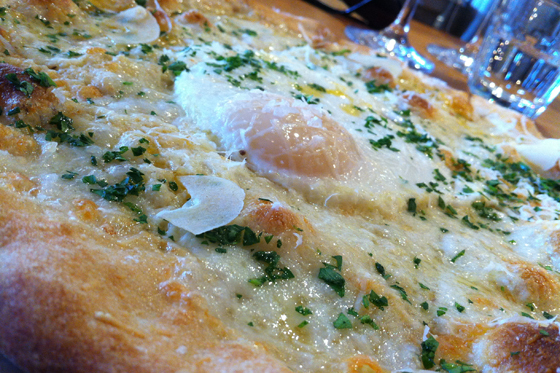 I had never even thought about topping a pizza with an egg. It sounded fantastic. 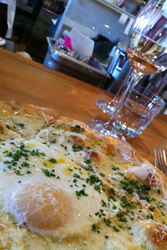 I ordered the “Bianca” pizza: parmesan, pecorino, mozzarella, shaved garlic, and chili oil. YUM. 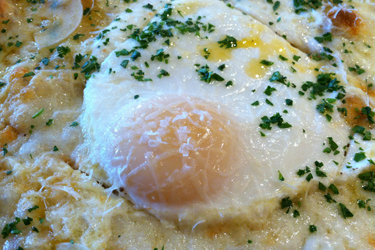 I wanted something that would be somewhat neutral (but delicious) so I could really enjoy the egg as an addition. What a lovely lunch. Fred also had a pizza with an egg on top, the “Funghi” with roasted mushrooms, stracchino, and shaved garlic. YUM. 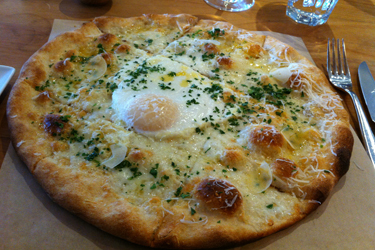 Pizza with an egg on top, especially a nice, artisan, thin crust pizza like this, was absolutely beautiful. 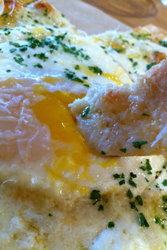 The tender and yet crisp crust, the different cheeses, and the smooth, rich egg all combined so wonderfully! I mostly dipped into the egg yolk with the slice I was eating, and I really liked it that way, but I also tried spreading the yolk around a bit so I could distribute it a little more evenly. The center piece with most of the yolk on it was also delicious. There have been so many awesome new things I’ve tried this year for I’ve Never Done That, but I have to say one of my favorite new food experiences is the runny egg. When done right, it adds such a magical layer of taste and texture to a dish – it truly elevates it into something even more special than the original. If you haven’t tried it, you simply must. I can’t believe I’ve missed out on something this great for so much of my life! Grandpa always used to crack a raw egg over a steaming, hot bowl of rice and stir everything around, probably for that same texture!